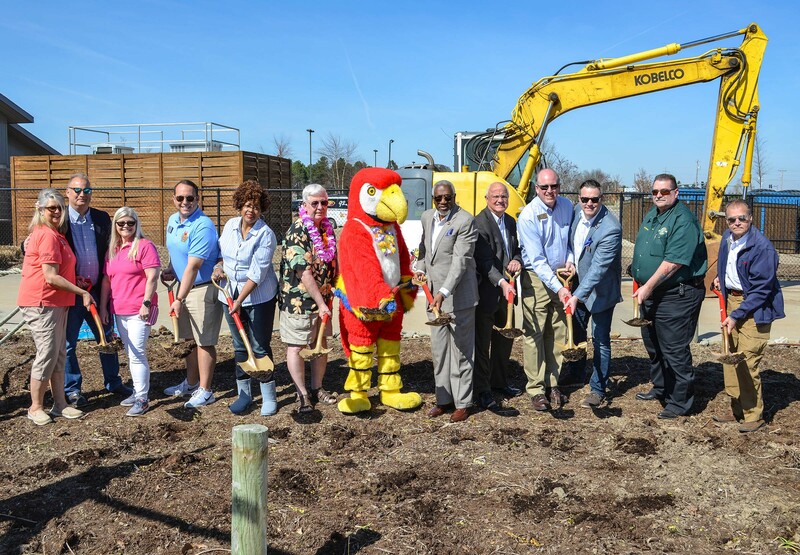 Fort Smith, Arkansas – March 22, 2019 – Representatives at Parrot Island Waterpark are thrilled to announce they have broken ground on the new FlowRider® Double for 2019 season. On Friday, March 22, park management and the Fort Smith Chamber of Commerce hosted a groundbreaking event along with City and County Officials. The FlowRider® Double is set to be operational for the 2019 season. Designed and engineered in Southern California by WhiteWater, the FlowRider® Double gives patrons of all ages the opportunity to experience the thrill of surfing. A thin sheet of water (approximately 3 inches) is pushed across a patented trampoline-like ride surface by use of powerful pumps. This creates an “endless wave” on which patrons can bodyboard or stand-up ride on a board that is a hybrid of a skateboard and snowboard. The FlowRider® Double has the option of placing an inflatable divider in the middle so that two patrons can safely ride simultaneously. To celebrate this exciting new addition, Parrot Island Waterpark has kicked off its 2019 Pre-Season Sale. For a limited time, 2019 Season Passes will be discounted 10%. This will be the lowest price offered for 2019 season. Season Passes are available for sale online at www.parrotislandwaterpark.com, at the Parrot Island Waterpark ticket office, located at 7300 Zero Street in Ben Geren Park Fort Smith, or by phone at 479-788-6550, Monday-Saturday from 9:00 a.m. to 5:00 p.m.
Parrot Island Waterpark features the region’s only wave pool, four awesome twisting turning water slides, a relaxing lazy river, an activity pool and a themed children’s aquatic play area. The outdoor waterpark has over 370,000 gallons of aquatic fun and has a variety of amenities, including party pavilions, cabana rentals, food and beverage concessions, 800 complimentary deck and lounge chairs, over 250 complimentary water tubes, expansive grass lawns for relaxing and much more, and is open Memorial Day through Labor Day. Located at Ben Geren Park, residents and visitors can enjoy Parrot Island Waterpark along with miniature golf, go karts, playground equipment, outdoor picnic areas and pavilions, softball and soccer fields, tennis courts, a 1 ½ mile fitness and circuit walking trail, two 18-hole disk golf courses, over eight miles of paved bike trails, 11 miles of mountain bike trails, and an outstanding 27-hole county golf course.